My grandmother always said “baby don’t let your eyes be bigger than your stomach, for all it does is breeds waste,” and I am here to write she has never lied. But we live in a culinary society where it is a similitude of Texas. Bigger is better and more is the way to go. But I think I understand the marketing behind bigger; when things are bigger it almost acts as a blinding effect, and it perpetuates sensory overload, and for some reason you cannot judge rightly, and the reason you cannot is your other senses have become temporarily frozen. When these situations occur it is absolutely vital that you turn your focus up to the highest level, because if you don’t you will be visually enthralled, but delectably challenged. 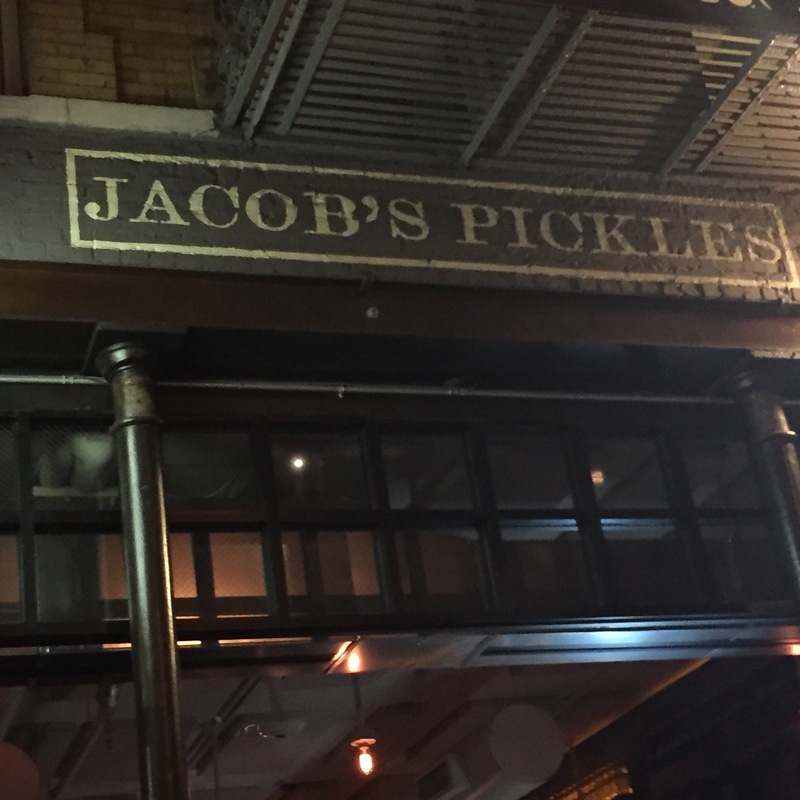 Jacob’s Pickles on the Upper East Side of Manhattan has an intriguing name and they are bordering on being a marketing genius, so let’s breakdown the experience accordingly. Jacob’s Pickles does not take reservations for parties of 6 or less and the wait staff have opted to wait on the tables at a tortoise pace so I asked myself what does this methodology create? One, it creates lines outside and an image that this restaurant is popping so much that people will wait for up to 2 hours for a seat. 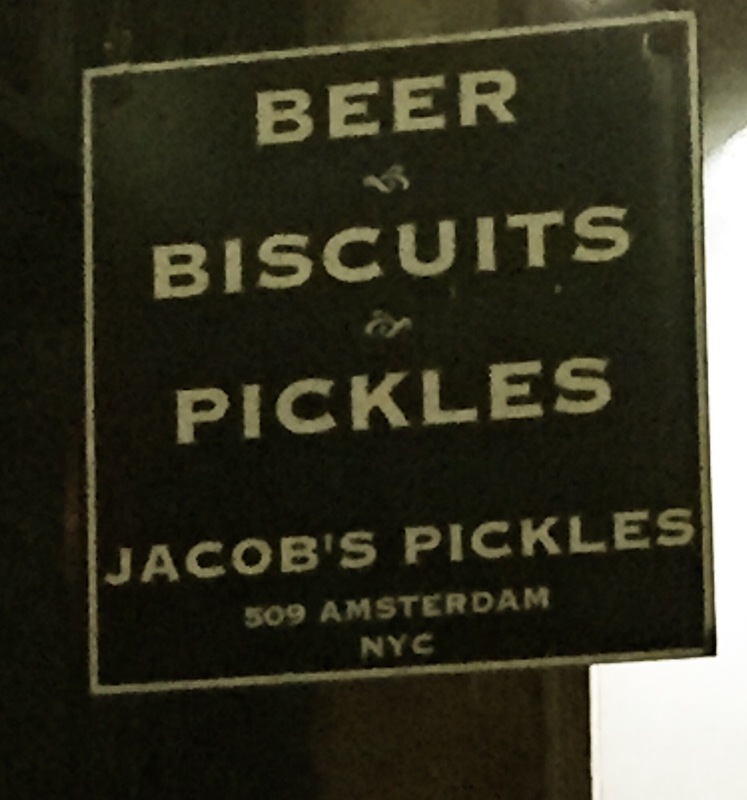 There second genius move is the loud music, and not just any music, music by Drake, Nicki Minaj, and some other people whom I don’t know their names, makes it appears that Jacob’s Pickles is not only trendy, socially engaging, but will definitely give you an opportunity to bob your head while your wait. And Imma tell you for the first few seconds you are definitely vibing and the beats are really hitting you, but as soon as you have to consistently say, “huh, what” to your social counterparts more than twice, then you are forced to move in extra close to them, because you cannot hear what they are saying, and you find yourself becoming horse because you are forced to speak at a higher octave, then it dawns on you that no one is dancing, this is not a club, and everyone is sitting and eating, therefor the music should not be this loud, and only persons singing is the wait staff then, that vibe that you initially had becomes a fleeting a moment. So now it is time to sit and this crafty marketing strategy strikes again, because after waiting for an hour and twenty-five minutes I am absolutely famished, so I am completely onboard for the bigger is better concept. My brain and my stomach is telling me no matter how much they bring I will eat every last drop, I mean I have not even drank any water because I did not want use any stomach space unnecessarily. 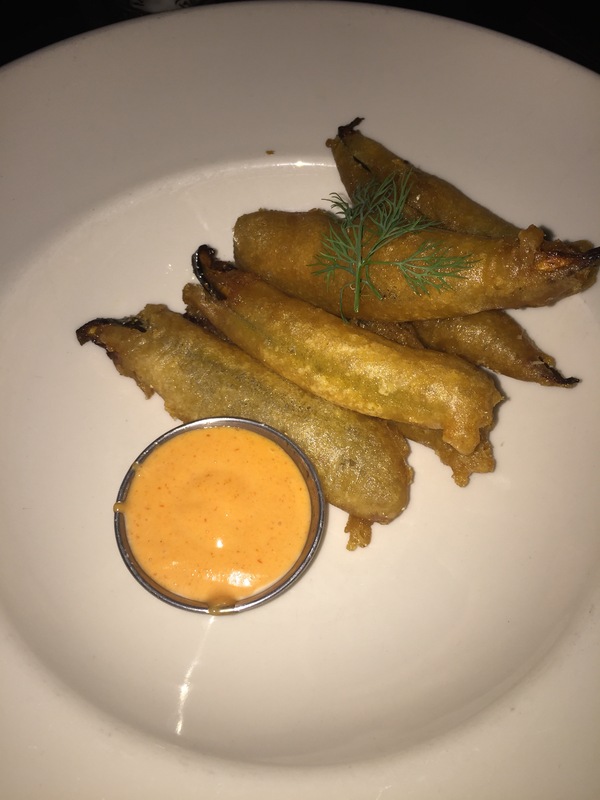 First on the menu would be exactly what you expected, fried pickles. I am pretty confident that in 2016 in the land of food tv and cooking channel everyone is keenly aware that a pickle is simply a pickled cucumber. Now when it comes to pickling some people simply just do it better than others. I am not really sure how the whole pickling process works, but i do know that the end result should not be that I think I am eating a cucumber. Jacob where was the saltiness, how come my throat didn’t get tickled by the brinyness, and why was it so firm that I felt like the process to make it a pickle only started while I was waiting for almost 2 hours for a seat. Second up, the special of the night, macaroni and cheese chicken parmesan. What exactly does this dish breakdown to being is normal mac and cheese, with marinara sauce, and a breaded chicken fillet. When this dish came out in its cast iron pan, piping hot, patchy scorched pieces of cheese from being under the broiler, my eyes lit up like stars. My first thought was who are they bringing this dish too, me or a family of four and two how in the world would I ever be able to tackle this Fred Flinstone meal. So I developed a strategy, I was gonna work my way in starting from the sides. The pasta noodles were penne, and perfectly el dente. The cheese was beautifully gooey and gave me the whole string effect in all of my 7 bites that I ate, and the chicken was very tender. The first bite I thought, “this ok,” but if you have been following me on this blog, you know my quest in food life is to find more than just ok. Second bite, I am feeling the same. Third bite, it has happened I start to think this is good, but I am still not where I wanna be on the euphoria scale. I take several more bites and not only am I stuffed but I have an epiphany. 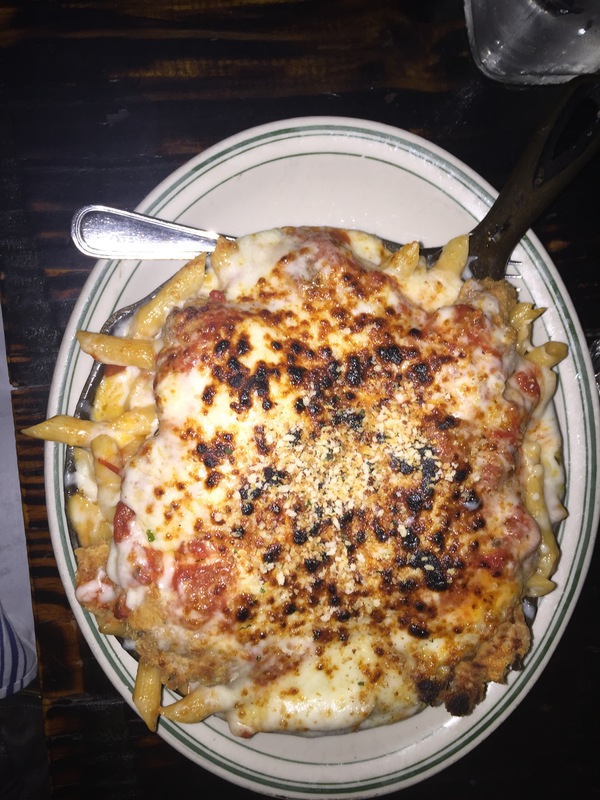 That epiphany is that maybe the mac and cheese chicken parmesan was to hot for me to enjoy to its fullest capacity, maybe all the flavors had not settled in the right spot yet, maybe this dish was better as a leftover. Leftovers are funny, some dishes can be good on opening night, but on the second night it really puts on a show. I get this effect with stuffing and my dad’s spaghetti and meatballs. So in my efforts to ensure that I was being fair, I ate it a day later. A day later, after reheating properly in the oven, i still got the same effect of cheesiness and girth, but what I didn’t get was anything beyond thinking this was “simply ok.” Which is kinda synonymous with being dull and leaving me with unfulfilled palate. Jacob’s Pickles you remind me of the too cool for school kids and nothing about this blog is gonna make you change your marketing campaign, but I will tell you to at least to try to increase your seasonings and your flavoring so when the visual sensory overload comes to an end, what you are left with is the best tasting meal on the block. Patrons feeling like they had adequate food service where time is concerned, and non-bleeding eardrums. The food looked so good. I would asked to go there,but I am glad to know that this is not another place where money will not be wasted.